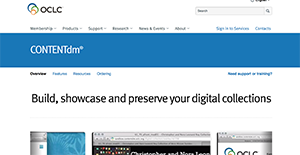 CONTENTdm is a Digital Asset Management (DAM) service with tools for building, showcasing, and preserving digital collections. The application is used mainly by libraries, museums, and historical organizations. With CONTENTdm, digital files can be displayed in a website that is customized based on the user’s target audience. The personalized page is powered with search engine optimization in order to make the materials discoverable by anyone around the world. Metadata can also be shared via premiere library database WorldCat Digital Collection Gateway, as well as other repositories. Master files are safely stored in CONTENTdm’s cloud-based archive. Though secure enough for long-term preservation, files can still conveniently be retrieved and monitored whenever needed. The primary benefit of CONTENTdm is how it can store, manage and deliver digital collections. More than just being a basic repository of digital assets, users are able to personalize their collections in a branded website. Integrated tools can give the page a uniformed look and feel, all of which are easy-to-use even for those who have no background in web programming. Users can make their resources available to more people through CONTENTdm’s integration with WorldCat, an online catalog of library collections. The free, self-service tool allows students, scholars and anyone in need to search through digital archives from anywhere around the globe. The application helps make assets storage more efficient for organizations using it. This is because of how its system supports different kinds of document, image, video, and audio files. Users are also given full control over the descriptions, access, and display properties of their digital assets, all of which can be customized using metadata fields for hassle-free file retrieval. Libraries and similar users do not need to worry about assets security as master files and digitized originals are protected in a preservation hub. CONTENTdm’s system regularly inspects accounts to make sure that no one gets to tamper with the saved files. Quality checks are also conducted every time something is saved, with results monitored in an individual “health record” per asset. Users are also given periodic security reports regarding the status of their collection. If you are considering CONTENTdm it might also be a good idea to check out other subcategories of Best Digital Asset Management Software collected in our base of B2B software reviews. Organizations have unique wants and requirements and no software application can be perfect in such a scenario. It is pointless to try to find an ideal out-of-the-box software system that fulfills all your business needs. The smart thing to do would be to customize the solution for your unique wants, staff member skill levels, budget, and other aspects. For these reasons, do not hasten and pay for well-publicized leading solutions. Though these may be widely used, they may not be the best fit for your particular wants. Do your homework, investigate each short-listed platform in detail, read a few CONTENTdm reviews, speak to the vendor for explanations, and finally select the product that provides what you require. How Much Does CONTENTdm Cost? We realize that when you make a decision to buy Digital Asset Management Software it’s important not only to see how experts evaluate it in their reviews, but also to find out if the real people and companies that buy it are actually satisfied with the product. That’s why we’ve created our behavior-based Customer Satisfaction Algorithm™ that gathers customer reviews, comments and CONTENTdm reviews across a wide range of social media sites. The data is then presented in an easy to digest form showing how many people had positive and negative experience with CONTENTdm. With that information at hand you should be equipped to make an informed buying decision that you won’t regret. What are CONTENTdm pricing details? What integrations are available for CONTENTdm? If you need more information about CONTENTdm or you simply have a question let us know what you need and we’ll forward your request directly to the vendor.